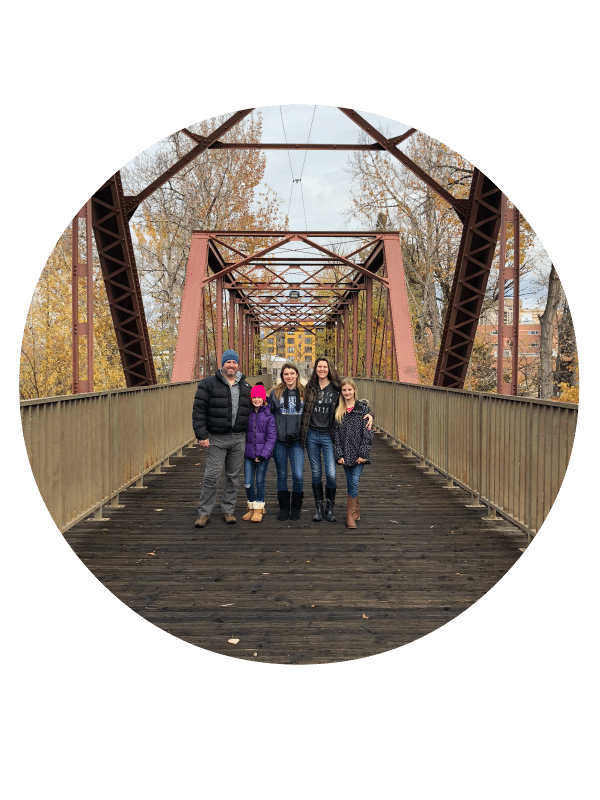 Looking for some delicious hot air fryer recipes that are simple and certain to be a family favorite? Wondering whether you should buy an air fryer for your kitchen? We’ll tell you why we love ours and share breakfast, lunch and dinner air fryer recipes that will simplify your life in the kitchen. No matter if you’re new to the Air Fryer world or not, it’s safe to say that once you use it, you’re hooked and looking for easy hot air fryer recipes like these. Who doesn’t love a bite of crispy delicious food without the worry and taste of grease or oil? Using an Air Fryer is such a simple way to create fried dishes without the worry of feeling bogged down later by grease. An Air Fryer is a small kitchen appliance that gives your food the taste of being fried, without actually submersing in grease. Using air and heat to circulate, your food will have that crispy fried taste without the use of oil or grease. If used properly, the Air Fryer can cut down on the amount of fat and calories that you consume on a daily basis because of using air circulation rather than oils to cook. Do you need to use oil in your Air Fryer? Some people chose to completely eliminate oil from their Air Fryer recipes, some add a bit inside, while others may decide to add a tablespoon or two on the food itself to crisp up the skin/outsides even more. Keep in mind that there are steps that you need to read and understand if you are going to add oil into your actual Air Fryer and you should read the owners manual for your particular model to see what is recommended. What are the benefits to buying an air fryer? Cuts down on the calories and fat content in food that you may typically fry. 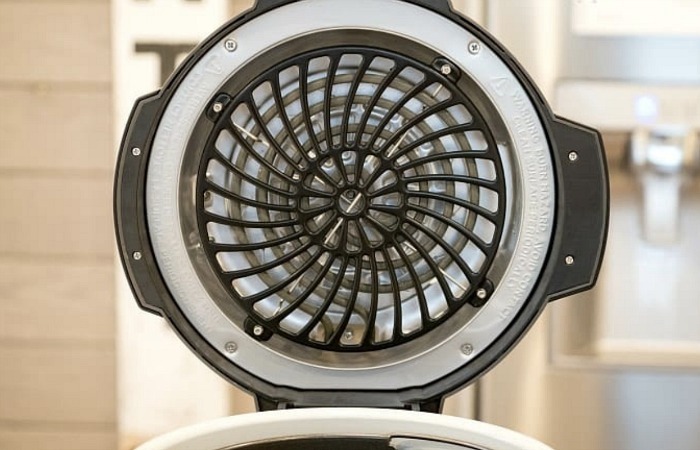 Drastically reduces clean up time in the kitchen because it’s literally a breeze to keep clean! Made with safety features so that even novice cookers or supervised children can use to cook and create in the kitchen. Has the ability to make literally all sorts and varieties of food taste delicious and crispy! Once you make your first recipe with the Air Fryer, you’ll fall in love with the ease of use! 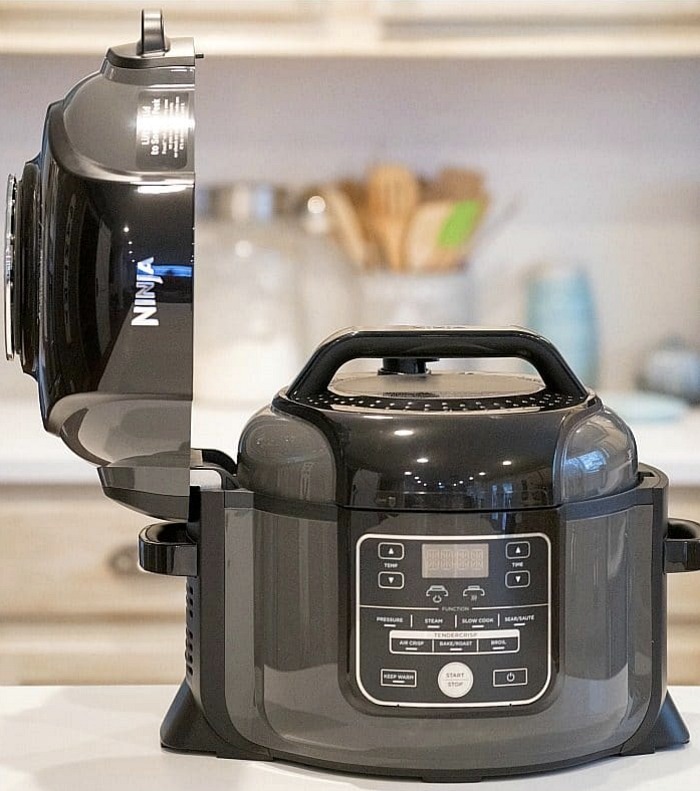 Ninja Foodi air fryer and pressure cooker (all in one, the one we have pictured above and below). Ninja also has a version that is just an air fryer as well that is smaller. This air fryer and dehydrator has a rotisserie feature as well if you’re interested in all 3 methods of cooking. Cheapest air fryer on the market yet is small, may work well for 2 people. Why use an Air Fryer versus the oven? While the oven does a good job of cooking and crisping food as well, it just takes a whole lot more time! Think about how long it takes to preheat your oven, then add, cook, check, maybe cook some more…and during that time, that heat is also heating up your house. (if it’s during the winter that may be fine, but during the summer months? No thanks.) When it comes to cooking quickly, the Air Fryer wins hands down. Other reasons to use the Air Fryer versus the oven? If you’re on the fence about whether using an Air Fryer is right for you, there are plenty of resources available to educate yourself. 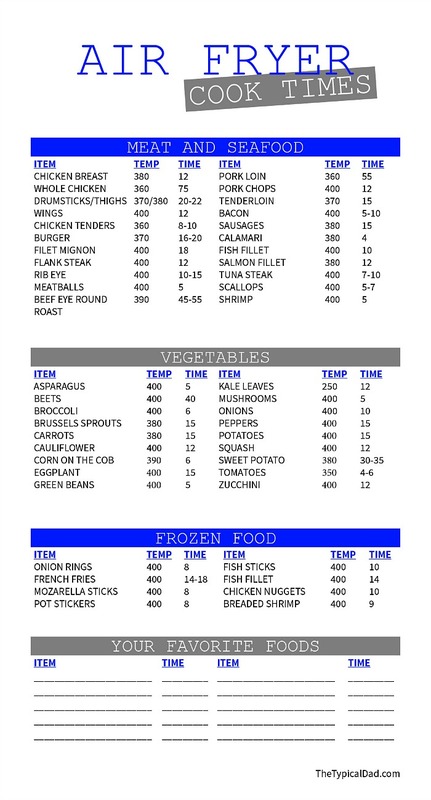 We have a free printable air fryer cook times chart you can put on your fridge to help you find the info. you need quickly! If you’re opposed to free you can buy this magnetic air fryer cooking time chart to reference how long each food cakes to cook too. 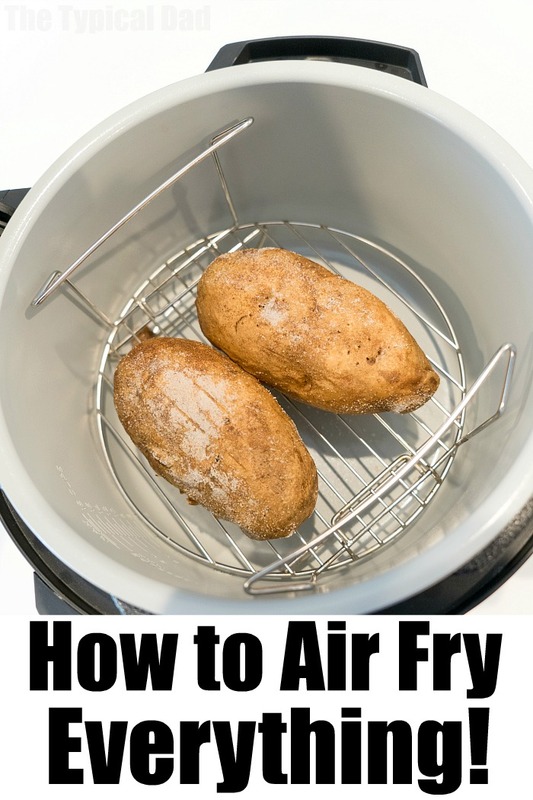 Now that you have a bit of knowledge about Air Fryers here’s a ton of delicious recipes below so you can be on your way to becoming the Air Frying expert at your house! 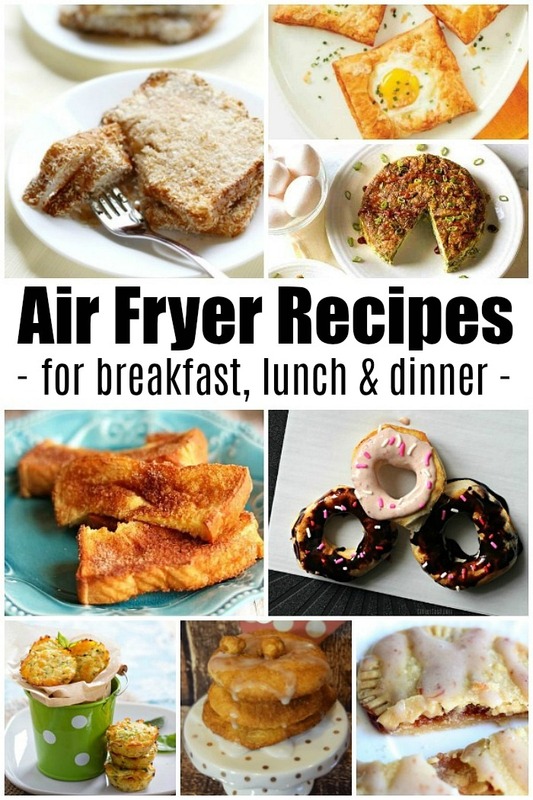 Now here is a list of easy hot air fryer recipes for you! The first recipe we made were these Ninja Foodi air fryer french fries which were super easy. Air fryer potato wedges are thicker than fries. Air fryer baked potatoes post is on it’s way here. Air fryer potato chips are the kids fave. If you haven’t tried Ninja Foodi kale chips they are so good! Air fryer pork chops are the bomb. Air fryer fried chicken is a family favorite. Easy air fryer vegetables make for a great side dish. Tempura vegetables in the air fryer are so good too. Air fryer broccoli gives it a great texture. Air fryer beef jerky is easier than using a dehydrator.